LAKE BUENA VISTA, Fla. -- Minor League Baseball named Portland Sea Dogs president Charlie Eshbach, who celebrated his 40th year in baseball in 2013 and his 20th with his current club, the "2013 King of Baseball" Thursday night at the annual Baseball Winter Meetings Banquet. 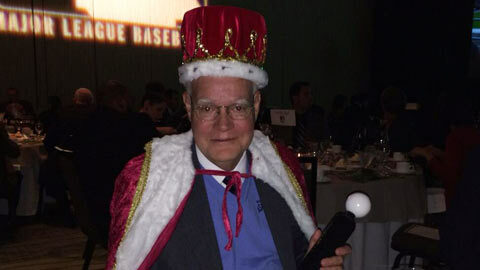 The "King of Baseball" is a long-standing tradition in which Minor League Baseball salutes a veteran from the professional baseball world for long-time dedication and service. Eshbach was the Sea Dogs' first employee and has overseen the Eastern League club since its inception in the fall of 1992. He was selected as the Eastern League Executive of the Year in 1994 and 2002. He began his baseball career began in 1974 with the Elmira Pioneers (New York-Penn League). The following year, Eshbach joined the Bristol Red Sox, Boston's Double-A team in the Eastern League. He is the longest serving active member of the EL, having served in it since 1975. Besides his time with Bristol and Portland, Eshbach also served as the general manager of the Reading Phillies. Eshbach was elected EL President in the fall of 1981 at the age of 29. He held the post for 11 years and was presented the inaugural Warren Giles Award for outstanding service as a league president in 1984. In 1988, Charlie served as interim president of Minor League Baseball, after the death of John H. Johnson.